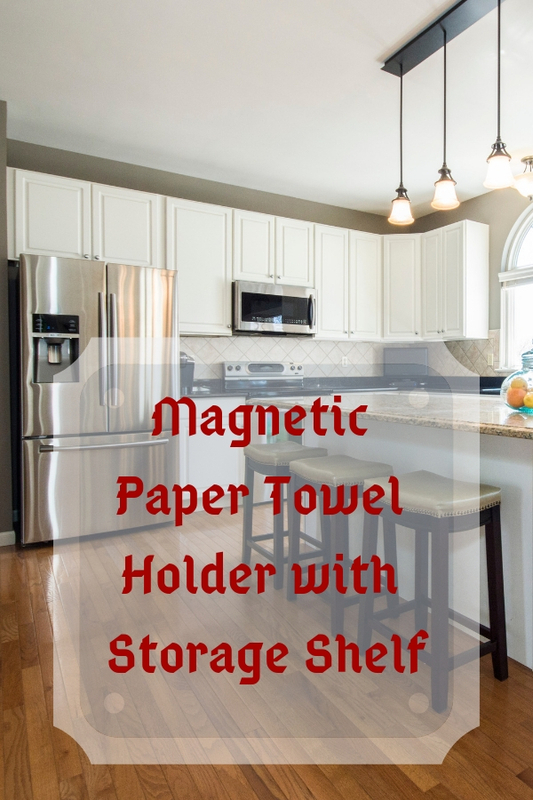 Do not hesitate to apply magnetic paper towel holder with storage shelf if you aim to have more space in your kitchen. Thanks to its strong magnet adsorption, it features a super easy installation. All you need to do is stick it to a refrigerator door or any other kitchen appliance such as microwave or oven that featuring magnetism metal surface. It is multipurpose organizer as its name implies. Apart from holding a roll of absorbent paper that you usually use for drying things, it also can be used as organizer for spice container, condiment jars, plastic wraps or aluminum foil or even utensils. Yes, there are few options from the simplest rack to few layers shelves for cater your needs based on your daily usage. All in all, they will help you to organize these ordinary kitchen supplies in a tidy and easy access way. This is the simplest one compare to the rest of options in this page. It holds a roll of dish towel while having a rack on top of the roller for condiment bottles. The roller is adjustable from 9 to 11.8 inches so it has no issue to hold any size of paper towel even it is jumbo roll. This is another simplest design gadget for a modern kitchen. It has similar features as the above one. The only different is that this upper rack comes with a plastic wrap dispenser. You can keep spice bottles or aluminum foil on left side while slot in plastic wraps on right side. Consider this rack if above simplest rack with a single adjustable roller could not fulfill your requirement. Similarly, you can stick it on fridge wall or any other metal surface right after unboxed. By having two tier shelves, you have more space for your daily use kitchen accessories. Better still, it comes with six utensil hooks which can be adjusted to slide in position where you aim to. You will like the convenient features that it carries on. This large fridge organizer definitely can save your countertop space and keep your kitchen in tidy look. You can organize seasoning bottle or spice jars on the top rack or bottom rack then utilize rollers for plastic wrap or aluminum foil. There are five removable hooks come with this organizer. They are ideal gadget for hanging lightweight tools such as scissor or dish cloth. Can you imagine what items can be hold by this organizer? It actually has similar functions as the above rack. You can use it to hold your spice jar and hanging utensils. The bars can be either hold a roll of paper towel or hang a dish cloth. It is multi-purpose rack and it is totally depends on you to organize your kitchen accessories at your convenience way. Copyright © 2019 Cheery Room. All Rights Reserved.